# Xiaoyi Huang, Yisha Gao and Jing He contributed equally to this work. Aberrant folate metabolism is closely related to tumorigenesis. Genetic variations in the Reduced folate carrier 1 (RFC1) may alter the progress of folate metabolism, and thereby cause the initiation and progress of the cancer. Considerable studies have performed to investigate the association between RFC1 G80A (rs1051266) polymorphism and cancer susceptibility, but the conclusions were conflicting. Therefore, we conducted a meta-analysis to reevaluate the association of RFC1 G80A polymorphism with cancer risk. PubMed and EMBASE were searched for eligible studies. The association of RFC1 G80A polymorphism and cancer risk was evaluated by the pooled odds ratios (ORs) and corresponding 95% confidence intervals (CIs). The significant association was found between RFC1 G80A polymorphism and hematological malignance susceptibility (A vs. G: OR=1.11, 95%CI=1.003-1.23, P=0.045; GA vs. GG: OR=1.18, 95%CI=1.06-1.31, P=0.002; AA+GA vs. GG: OR=1.18, 95%CI=1.07-1.29, P=0.001). Stratified analysis by ethnicity indicated that the association became more prominent among Caucasians (GA vs. GG: OR=1.28, 95%CI=1.12-1.45, P<0.001; AA+GA vs. GG: OR=1.21, 95%CI=1.08-1.36, P=0.001). In term of the cancer type, this polymorphism significantly increased the risk of acute lymphoblast leukemia (GA vs. GG: OR=1.13, 95%CI=1.001-1.28, P=0.048; AA+GA vs. GG: OR=1.28, 95%CI=1.13-1.46, P<0.001) and acute myeloid leukemia (GA vs. GG: OR=2.57, 95%CI=1.37-4.85, P=0.003). No significant association between RFC1 G80A polymorphism and overall solid cancer risk was observed, but a protective association with digestive cancer risk was found (GA vs. GG: OR=0.89, 95%CI= 0.81-0.99, P=0.030). The comprehensive meta-analysis encouraged the notion that RFC1 G80A polymorphism may play an important role in hematopoietic system malignance. These findings need further validation in the large multicenter investigations. Cancer, one of the leading causes of death all around the world, is a result of multiple environmental and genetic risk factors, as well as gene-environment interactions. According to the cancer statistics, approximately1658370 new cancer may occur in USA in 2015 . Although substantial resources have been dedicated to cancer research, cancer is still a huge threat to human. It is well known that both environmental and hereditary factors play critical roles in the initiation and progression of cancer . Among genetic factors, genetic mutation and epigenetic change such as DNA methylation can lead to carcinogenesis . One-carbon metabolism is closely related to DNA methylation, in which folate, a member of water-soluble B vitamins family , plays an important role [5, 6]. Folate is an essential material in cell proliferation and tissue regeneration [7, 8], which cannot be synthesized in the mammalian cell, and must be obtained from extracellular environment to support one-carbon transfer biosynthetic reactions . Folate deficiency can result in DNA hypomethylation and gene instability and subsequently induce disease by changing gene expression and increasing DNA impairment. Studies have shown that folate metabolism dysfunction are implicated in a variety of diseases, such as neuroblastoma , breast cancer , non-Hodgkin lymphoma [12, 13], and neural tube defect . Given the crucial role of folate, its transporters including folate receptors (FRs), proton-coupled folate transporter (PCFT) and reduced folate carrier (RFC) are of great importance to the maintenance of hemostasis humans . Reduced folate carrier 1 (RFC1)/solute carrier family 19 members 1 (SLC19A1) gene, located on chromosome 21, encodes a folate transport protein that has been considered as one of the major components of folate transport system [15, 16]. Besides, RFC1 also plays a part in antifolate transportation during chemotherapy , and RFC1 gene variation can affect the outcome and toxicity of methotrexate (MTX) therapy in leukemia . RFC1 G80A polymorphism located in exon 2 leads to an amino acid substitution of histidine for the arginine at codon 27 (H27R) of RFC1.This polymorphism may influence the function of RFC and one-carbon metabolism, thereby inducing tumorigenesis . Lack of folate leads to DNA synthesis disorders and therefore causes genomic instability. Thus, RFC1 G80A polymorphism can affect DNA synthesis in the pathogenesis of cancer. Previously, RFC1 G80A polymorphism had been proven to be a risk factor of acute lymphoblastic leukemia in some studies , but other studies showed that RFC1 G80A polymorphism was not related to the risk of acute lymphoblastic leukemia . Moreover, the impact of RFC1 G80A polymorphism on solid cancer risk was not definitely known. Recently, several studies have explored the association between RFC1 G80A polymorphism and solid tumor, including colorectal cancer [22-25], gastroesophageal cancer , bladder cancer , breast cancer [28-31] and nervous system cancer . Naushad et al. found that RFC1 G80A polymorphism conferred increased susceptibility to breast cancer, while De Cassia Carvalho Barbosa et al. indicated that the same polymorphism had the protective effect on breast cancer. The association between RFC1 G80A polymorphism and cancer risk was controversy. Therefore, it is necessary to conduct a comprehensive analysis to clarify the association. The PubMed and EMBASE were searched thoroughly without any language restriction to seek potential studies. The following keywords were used for literature search: “RFC, reduced folate carrier gene, rs1051266, RFC1 G80A, or SLC19A1”, “polymorphism, variant, or variation”, and “cancer, neoplasm, or carcinoma”. Additionally, literature was searched by manually screening the reference lists of the eligible studies and reviews. The last search was performed on March 31, 2015. The articles included met the following criteria: (a) studies focused on the association between RFC1 G80A polymorphism and cancer risk; (b) case-control studies or other observational studies; (c) studies providing the genotype distribution data or other original data that can be used to calculate genotype distribution. Exclusion criteria were as follows: (a) duplicate studies; (b) lack of enough data of genotype distribution or data for deducing genotype distribution; (c) not case-control studies. Two investigators extracted data from eligible articles separately. The following data were extracted from the original articles: (1) authors, (2) year of publication, (3) country in which study was conducted, (4) ethnicity, (5) type of cancer, (6) sample size, and (7) alleles and genotypes distribution. When argument occurred between the two investigators, the disagreements were solved by the third investigator. The disagreements were fully discussed by all the three investigators and then vote by ballot among all the researchers. All genotypes frequency of RFC1 G80A polymorphism was calculated and chi-square test was employed to assess the Hardy-Weinberg Equilibrium (HWE) in control subjects for every study. The association between RFC1 G80A polymorphism and cancer risk was assessed by calculating pooled odds ratio (OR) and 95% confidence interval (CI) under the five genetic models: comparisons of allele frequencies, homozygous, heterozygous, dominant, and recessive models. All the statistical tests were two-sided and the result with P<0.05 was regarded as a statistically significant. Q value and I2 were used to evaluate the between-study heterogeneity in the heterogeneity test. The random effects model were hired to calculate the pooled OR and 95% CI when I2>50%. Otherwise, the fixed effect model was adopted. Moreover, subgroup analyses were performed according to ethnicity and cancer type. Subsequently, the sensitivity analysis was performed by successively removing one study at a time to recalculate OR and 95% CI. 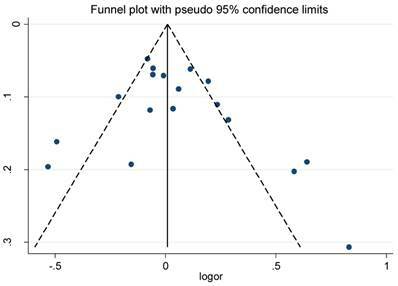 Publication bias was assessed by funnel plots and Egger's linear regression test. 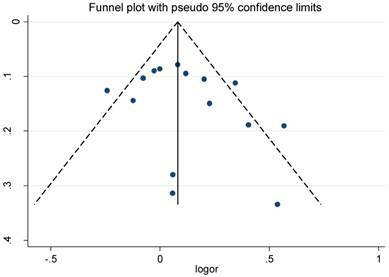 If the funnel plots were asymmetry or P<0.1, publication bias was considered significant. All the results above were performed by STATA 12.0 (STATA Corporation, College Station, TX). Using the keywords, 454 and 240 articles were retrieved from PubMed and EMBASE, respectively. Most of studies were excluded after carefully reading the titles and abstracts. The remaining articles were further evaluated by reading through the text. As a result, 28 eligible articles were included in the meta-analysis. Additionally, 2 articles were found through manually searching the reference lists of the eligible studies and reviews. 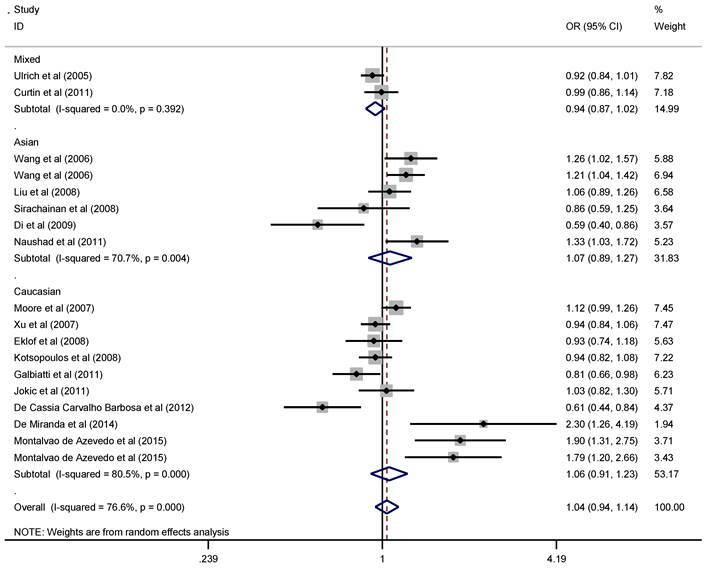 In total, the meta-analysis contained 30 articles consisting of 33 studies with 12020 cases and 14343 controls, focusing on the relationship between RFC1 G80A polymorphism and cancer risk (Figure 1). The characteristics of the studies included in the meta-analysis are shown in Table 1. Flow chart of the study selection and inclusion process. Since the pathogenesis of solid cancer and hematological malignance vary greatly, we explored the association of RFC1 G80A polymorphism with solid cancer and hematological malignance separately. The pooled ORs and 95% CIs indicated that there was no significant association between RFC1 G80A polymorphism and overall solid cancer risk (Figure 2). When stratified by cancer type, subgroup analysis indicated that RFC1 G80A polymorphism was associated with the decreased risk of digestive system cancer under the heterozygous model (OR=0.89, 95%CI=0.81-0.99, P=0.03 ), while no significant association was detected for other cancer types (Table 2). However, RFC1 G80A polymorphism was shown to significantly increase the risk of developing hematological malignance (comparisons of allele frequencies: A vs. G: OR=1.11, 95%CI=1.003-1.23, P=0.045; heterozygous: GA vs. GG: OR=1.18, 95%CI=1.06-1.31, P=0.002; dominant: AA+GA vs. GG: OR=1.18, 95%CI=1.07-1.29, P=0.001), as are shown in Figure 3. Moreover, stratification analysis was performed by cancer type and ethnicity, as shown in Table 3. The association became stronger among Caucasians, but not valid among Asians (GA vs. GG: OR=1.28, 95%CI=1.12-1.45, P<0.001; AA+GA vs. GG: OR=1.21, 95%CI=1.08-1.36, P=0.001). With respect to cancer type, the studied polymorphism imparted increased genetic susceptibility to ALL (GA vs. GG: OR=1.13, 95%CI=1.001-1.28, P=0.048; AA+GA vs. GG: OR=1.28, 95%CI=1.13-1.46, P<0.001) and AML (GA vs. GG: OR=2.57, 95%CI=1.37-4.85, P=0.003). The funnel plot and Egger's test were conducted to test publication biases. The funnel plots of the association between RFC1 G80A polymorphism and solid cancer and hematological malignance were symmetrical in the allele model (Figure 4 and Figure 5). The Egger's test value indicated that there was no significant publication bias in our meta-analysis (P=0.304; 0.287; 0.768; 0.476 and 0.273 for allele, homozygous, heterozygous, dominant ,and recessive models of RFC1 G80A polymorphism and solid cancer risk respectively; P=0.219; 0.374; 0.183; 0.201; 0.686 for allele, homozygous, heterozygous, dominant, and recessive models of RFC1 G80A polymorphism and hematological malignance respectively). The sensitive analyses indicated that no single study could qualitatively change the results, suggesting the robustness of the meta-analysis. RFC is a typical facilitative transmembrane protein delivering 5-methyltetrahydrofolate from plasma into cells. The dysfunction of RFC has been shown to be related to several disease such as neural tube defects , congenital heart defect , Alzheimer's Disease  and homocysteinemia . Moreover, RFC is also responsible for transporting Methotrexate from extracellular fluid into intracellular fluid, which is an effective treatment for rheumatoid arthritis and acute lymphoblastic leukemia. Although RFC1 G80A polymorphism, leading to a histidine-to-arginine substitution at position 27 of the RFC protein, was first identified in as early as 2000 , the effect of this alteration is not fully clarified. Chango et al. indicated that individuals carrying AA genotype had higher plasma folate levels than those carrying GG genotype. Recently, increasing evidences have highlighted the importance of RFC1 G80A polymorphism in the pathogenesis of malignance [37-39]. To the best of our knowledge, this is the first meta-analysis focusing on the association of RFC1 G80A polymorphism and the susceptibility of solid cancer. Overall, there was no significant association between the RFC1 G80A polymorphism and solid cancers which was consistent with most of previously published results. On the contrary, some other studies considered RFC1 G80A polymorphism as a risk factor for tumorigenesis. The controversial results of these studies might be partially due to the variations among the different populations. In recent years, increasing researches have investigated the relationship of RFC1 G80A polymorphism and cancer risk; however, the association remains inconclusive. Thus, it is urgent to perform a pooled analysis to clarify the association of interest and give a general envisage of the impact of RFC1 G80A polymorphism on tumorigenesis. In part, this conclusion maybe results from the small sample size in each study. Moreover, a significantly decreased risk of digestive system cancer related to RFC1 G80A polymorphism was observed. Surprisingly, in the studies conducted by Xu et al. , Di et al. and Galbiatti et al. AA genotype was considered as wild type, while in the majority of studies GG genotype was regarded as wild type. This discrepancy may lead to conflicting results which may affect the relationship between RFC1 G80A polymorphism and susceptibility of solid cancer in the pooled analysis. Previous studies have shown that RFC1 G80A polymorphism is related to children acute lymphoblastic leukemia, and this polymorphism may affect the prognosis of acute lymphoblastic leukemia treated with MTX [18, 20]. Similarly, our meta-analysis demonstrated that the studied polymorphism increased the risk of hematological malignance. Koppen et al. and Vijayakrishnan et al. also performed comprehensive analysis on the influence of folate-related gene polymorphisms including the effect of RFC1 G80A polymorphism on susceptibility to leukemia. Koppen et al. 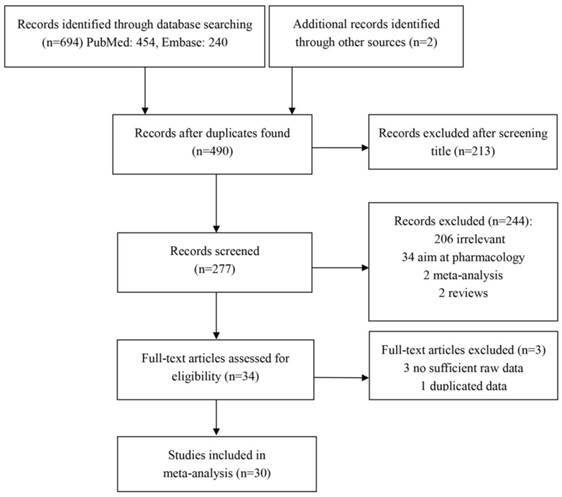 failed to find clear association between RFC1 G80A polymorphism and acute lymphoblastic leukemia partly because only one relevant study was included in their meta-analysis. Vijayakrishnan et al. indicated that RFC1 G80A polymorphism was related with acute lymphoblastic leukemia. Compared to the two previous meta-analyses, our study included more eligible studies and provided a more comprehensive and powerful evaluation on the relationship between RFC1 G80A polymorphism and hematological malignance. In the stratification analysis, RFC1 G80A polymorphism was found to be associated with increased leukemia risk in Caucasians under the heterozygous and dominant model, implying the interaction of the ethnic background and genetic variation in leukemia tumorigenesis. As for cancer type, RFC1 G80A polymorphism was associated with acute lymphoblastic leukemia under the heterozygous and dominant model, but not non-Hodgkin lymphoma. These results suggested that the RFC1 G80A polymorphism may play a different role in the pathogenesis of different type of hematological malignance. Besides, due to relatively small sample size of homozygous genotype AA carriers, the data presented in our meta-analysis cannot demonstrate more severe phenotype in homozygous non-synonymous mutation carriers than heterozygous carriers. Despite the interesting results in our meta-analysis, several limitations of the current study should be acknowledged. 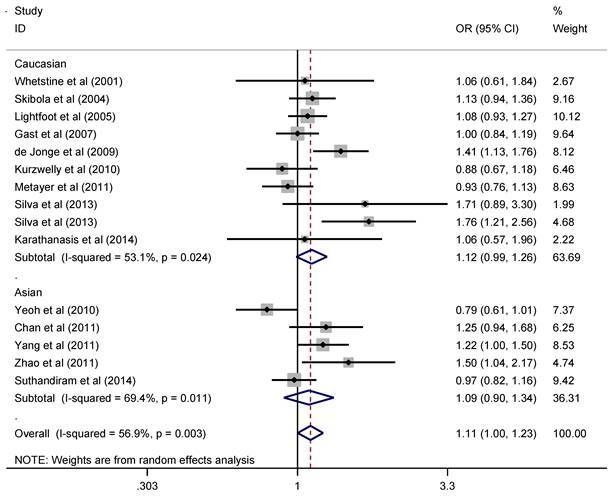 First, this meta-analysis only included published studies so that potential publication bias might not be avoided. Second, the influence of a single genetic variant on tumorigenesis is complicated by the gene-gene or gene-environment, which may lead to an unmeasurable deviation while evaluating the relationship between RFC1 G80A polymorphism and cancer risk in this meta-analysis. Third, we performed this meta-analysis with crude ORs since studies included in this meta-analysis lacked sufficient data for adjustment for confounding factors, which might affect the stability of our results. Last, random effect model were used in some genetic models, which might present unstable results. Therefore, validation for our findings from large, well-designed studies is needed in the future. In conclusion, the comprehensive meta-analysis confirmed the notion that RFC1 G80A polymorphism may play a significant role in hematopoietic system malignance. In addition, the relationship between RFC1 G80A polymorphism and cancer grade and patient prognosis can be a promising research to clarify the role of RFC1 G80A polymorphism in pathogenesis of cancer. Although the mechanism of how RFC1 G80A polymorphism contributes to cancer risk is not entirely clear, it is may be used as a potential biomarker for cancer diagnosis in the future. This work was supported by the National Natural Scientific Foundation of China (No. 81172077). We thank Huile Zhong (Guangdong University of Foreign Studies, Guangzhou, China) for polishing and editing the manuscript.